The Palomar Health Coding and Clinical Documentation team has rallied around their co-worker to show support for her debilitating disease. Carolyn Lane suffers from a severe form of vertigo, Meniere’s Disease, that prevents her from working in an office environment. The disease affects the portion of the inner ear and brain that controls balance and eye movements causing those afflicted with the disease to have ringing in the ears, become dizzy and nauseous and some might say to act like they are intoxicated. Carolyn works from home full-time to limit her vertical movements, which reduces the effects of the disease. 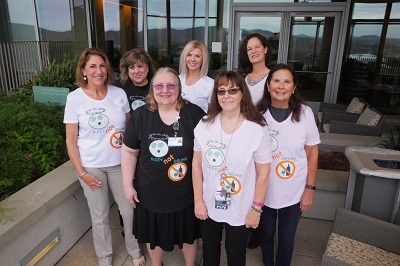 To show their support for her condition, Carolyn’s co-workers, some of whom have never even met her in person, purchased and wore T-Shirts sharing educational information about vestibular disorders during Balance Awareness Week. They also took up a collection and made an almost $300 donation to the Vestibular Disorders Association (VEDA) in Carolyn’s name. VEDA works to bring awareness and support of those affected by vestibular disorders like Meniere’s. Carolyn’s manager, Rose Dunn, says Carolyn is “extremely productive” and invaluable member of the six-person Clinical Documentation team even though she never physically comes into the office. Although the other five Clinical Documentation Improvement Specialists (CDISs) spend their entire day working inside Palomar Medical Center Escondido and Poway, speaking with physicians and making sure records accurately reflect patients’ diagnosis and treatment plans, Carolyn contributes in her own critical way. Dunn says Carolyn is always willing to pitch in and help CDISs who are running behind or are on vacation. As the early bird of the group, Carolyn reviews the new cases for the day and distributes the cases to the team members for the upcoming day. She assesses mortality cases for opportunities to improve the coding of the conditions of death. She maintains operational statistics for the team and is conducting second reviews of coded cases for accuracy before the claim is sent to the payer. Carolyn agreed to have her medical condition shared publically as she says she’s learned that many other people are dealing with the same issues. If you’d like to learn more or make a donation to education and research, visit the VEDA website. Photo caption: The Palomar Health Coding and Clinical Documentation team raised almost $300 for vestibular education and research.